The Group II advanced medical air mattress offers an accurate and adjustable pressure monitoring system. It includes an advanced pump with a built in microprocessor that monitors and maintains consistent pressure disbursement while stimulating blood flow and circulation. The air flow and pressure range can be customized according to each individual patient's weight. Designed to heal up to stage 4 bed sores. This alternating pressure mattress system is perfect for long term care. 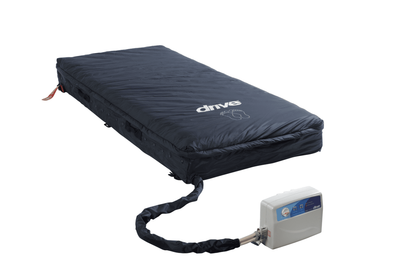 This alternating pressure mattress includes the mattress, pump and cover with a built in foam base under the air cells. Each alternating cell inflates and deflates over a preprogrammed 10 minute cycle time that protects the patient from pressure ulcers while healing existing bedsores. This adjustable air mattress system has a layer of air cells over a foam base that provides additional support while preventing the patient from bottoming out. In addition to the alternating cycle the medical air mattress also offers low air loss therapy in the trunk and pelvis area. This low air loss therapy allows the patient to remain cool and dry to help accelerate the healing process while preventing new bedsores and pressure ulcers from forming. 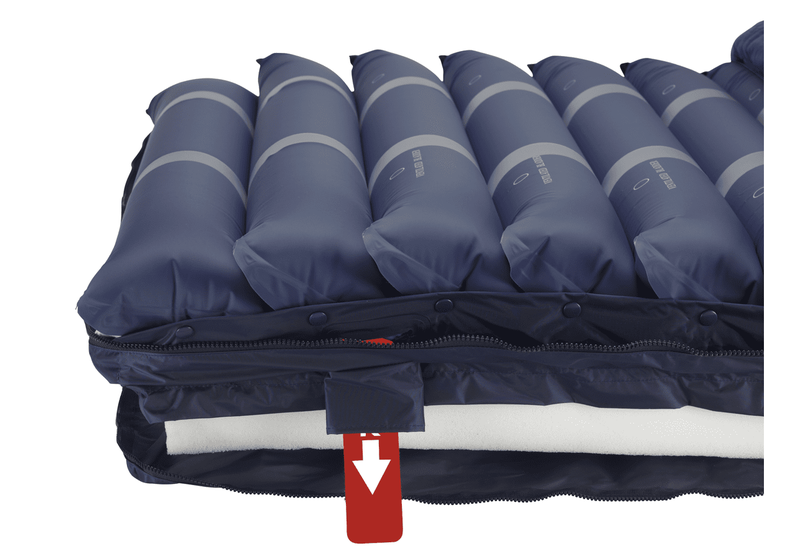 As an upgrade to most standard models the Group II Alternating Pressure mattress system has a built in safety feature that prevents the patient from "bottoming out" in the event of a power failure. The 3� foam base that protects the patient from making contact with the bed frame. This foam base can offer additional protection while the mattress is in an elevated position. The Group II Alternating Pressure Mattress is approved by Medicare and is designed to heal and protect the patient from existing and future bedsores, pressure wounds, and decubitus ulcers. Sleep better at night without constantly having to be shifted or turned. This alternating pressure mattress softly inflates and deflates under the patient to heal and prevent bed sores. Smart pressure detection technology provides smart auto-checking pressure feature to maximize patient�s comfort. External, large air filter intake for increased life expectancy and easy maintenance. Static function can suspend the alternating mode. Elegant zipper-all-around cover for easy cleaning and maintenance. Low air loss feature helps to prevent heat and moisture build-up. 80" Length x 35.4" Width total depth 8"
5" air cells 3" foam base total depth 8"